[Whitening & Anti-Wrinkle/ Anti-Aging Protection/Boost up Immune System/Repair Dull Skin/Maintain Collagen Level]Shangpree Acerola is 100% NATURAL Vitamin C ditetary supplement which is necessary to build and maintain healthy connective tissue, absorb the iron, and protect cells from free radicals. We need Vitamin C for the growth and repair of tissues in all parts of our body. Mixed with Acerola, Blueberry and Cranberry, SHANGPREE Acerola boosts up the immune system to maintain the body health. Its function is to protect skin against premature aging, to promote strong immune system, to enhance skin metabolism, to promote healthy teeth and gums, to prevent easy bleeding and bruising and to ease pain and swelling of joints. 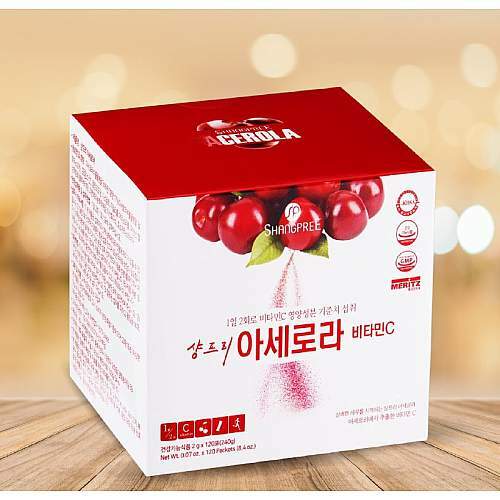 - ACEROLA: Boost up immune system; whitening and anti-wrinkle; Replenish and maintain collagen level; High anti-oxidant, anti-aging protection. - BLUEBERRY: Boost up immune system, high anti-oxidant, reduces age-related condition. - CRANBERRY: Improve teeth, gum and heart function, enhance skin healing process. [SUGGESTED USE] Take two packets daily.